From: Racist Hunger Games Fans Are Very Disappointed. All these… people… read the Hunger Games. Clearly, they all fell in love with and cared about Rue. Though what they really fell in love with was an image of Rue that they’d created in their minds. A girl that they knew they could love and adore and mourn at the thought of knowing that she’s been brutally killed. 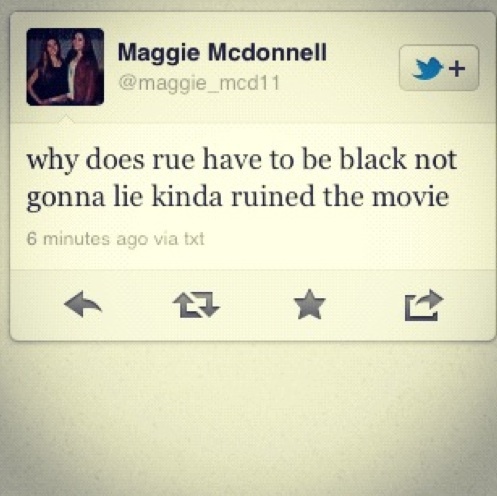 And then the casting is revealed (or they go see the movie) and they’re shocked to see that Rue is black. Now… this is so much more than, “Oh, she’s bigger than I thought”. The reactions are all based on feelings of disgust.